Rated 4.5 out of 5 stars.261 total votes. 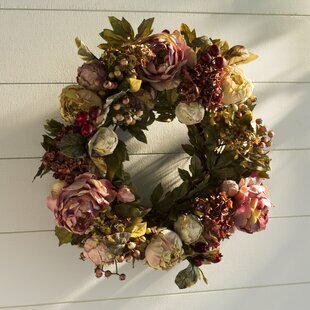 The 24" Peony Hydrangea Wreath is a gorgeous creation. The beautiful Peony flowers along with the berries, buds and the green leaves are arranged together to form the stunning wreath. The wreath from the house is easy to maintain. Pack it away when you are not using it and you will find it equally fresh every time you unpack it. Simply use a clean dry cloth to dust it once in a while, when the wreath is in use. The use of high quality material ensures great durability of the product. With Haute Decor interchangeable, clip-on icons you can give the adjustable wreath hanger a decorative touch for every season. Adjustable wreath hanger will adjust and compliment your style and décor year-round. Rated 4.5 out of 5 stars.32 total votes. Autumn Harvest Thanksgiving 22" Maple Leaf and Berry Artificial Floral Wreath with rich orange, red and green maple leaves and berries, this wreath is perfect for Thanksgiving or autumn harvest decorating. Foliage rests atop a natural grapevine twig base for easy hanging. No assembly required. Bring the beauty of fall indoors with lighted fall leaf wreath. Made using fabric leaves in elegant autumn colors and dried twig branches. We've enhanced the fall ambiance by adding 50 miniature lights to the wreath creating a delightfully warm glow. Rated 4.5 out of 5 stars.60 total votes. Celebrate fall with a heart-warming wreath design of tansy, safflower, pearly everlasting on a thicket of air dried boxwood topped with a lovely autumn plaid wired bow. This Pumpkin Gourd Maple Berry 26" Wreath is a natural fall mixture of pumpkins, gourds, mixed evergreens, cones, berries, and maple leaves bring all the textures of the season to your home. This Berry and Pumpkin Ted Turkey 12" Wreath is a great seasonal décor to spice up your fall offerings. Rated 4.5 out of 5 stars.83 total votes. Rated 5 out of 5 stars.19 total votes. Rated 5 out of 5 stars.26 total votes. The Autumn Elegance Sunflower Wreath is handmade on a sturdy vine base and filled with sunflowers, green hydrangea, Chinese lanterns, and pine cones nestled in a bed of green leaves. A stunning decorative accessory to be used as a front door wreath or wall decoration. May be used outdoors UV rated materials that are approved for outdoor use! Due to packaging and shipping, wreath may need to be fluffed before hanging. 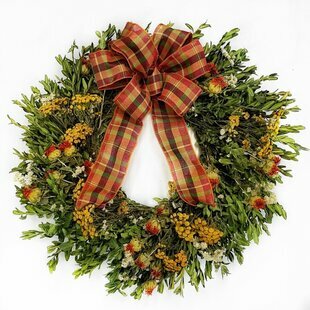 This wreath features a swirl of yellow, orange and red maple leaves on a woven branch base. It is trimmed with pumpkins and gourds, assorted pinecones and clusters of yellow and red berries. 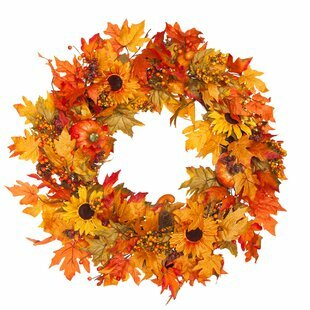 Display this colorful autumn wreath on doors, walls and windows in indoor or covered outdoor locations. The Berry Fall Thanksgiving Wreath is a perfect indoor fall decorative accessory to hang above a fireplace or on a kitchen or living room wall. A gorgeous representation of autumn, this seasonal wreath is stunning on a front door. Makes a perfect hostess gift, or birthday or anniversary gift for a friend, teacher or relative. This wreath features assorted maple leaves in bright fall colors flowing from an evergreen branch base. It is pre-lit with 70 clear lights and trimmed with orange gourds, pine cones and berry clusters for added natural appeal. 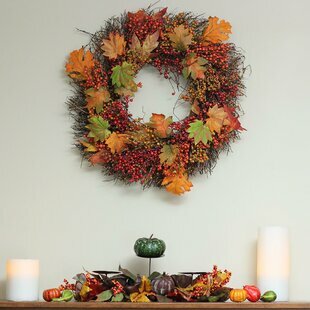 Display this autumn accented wreath on doors, walls, and windows in indoor or covered outdoor locations. This seasonal decoration features a ring of pinecones all flowing from a woven branch base. Mixed in with the cones are sprigs of bright red berries for added color and contrast. 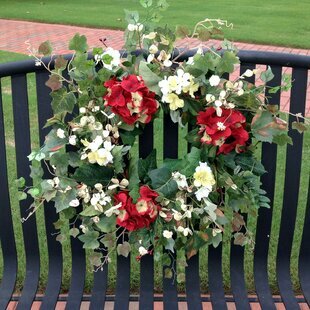 Display this rustic and country flavored wreath on doors, walls and windows in indoor or covered outdoor locations. This beautiful 14" Natural Birch Wood Wreath is the perfect accent piece for your front door or paired with frames and refurbished window decor. If you’re dining or kitchen table is looking bare, use the 14" Natural Birch Wood Wreath for a welcoming centerpiece paired with flowers and candles. The 14" Natural Birch Wood Wreath is also a beautiful option to use for wedding and shower decor. The natural wood looks stunning year-round. The circular shape of a wreath represents eternity, as there is no beginning and no end. It symbolizes growth and everlasting life. Bring a circle of life to your front door and enhance you holiday decor. Crafted from acrylic materials to emulate live growth, this Holiday 24" Wreath is suitable for indoor or outdoor use. To hang, a hook or wreath holder is required and is sold separately. Create a festive fall feeling and add a touch of traditional autumn color to your decor with this unique wreath. Features a cornucopia with leaves, berries, pine cones, acorns, and orange Chinese lantern flowers. Natural vine twig base for hanging. Add a touch of traditional autumn color to your fall decor. Welcome fall and all who visit for Thanksgiving with this vibrant wreath. Features bright orange colors offset by white hydrangeas and green leaves. Everyone should take the time to watch the leaves change. Capture the feeling of a crisp fall day with this lovely wreath. Display alone or pair with other decorative items to create a unique tabletop decoration. Product features: natural grapevine twig base for easy hanging bursting with berry red cream and ginger orange heather buds grass leave accent the heather buds unlit for indoor use only no assembly required wreath comes in 1 piece. This Beautiful 24" Sunflower Wreath built on a sturdy grapevine base. It is 24" in diameter and can be used both indoors and outdoors under a covered area. Direct exposure to sunlight or humidity will result in fading and a shorter life. If used properly this wreath will last for many seasons to come. This wreath features assorted maple leaves in bright fall colors flowing from an evergreen branch base. It is pre-lit with 35 clear lights and trimmed with orange gourds, pine cones and berry clusters for added natural appeal. Display this autumn accented wreath on doors, walls and windows in indoor or covered outdoor locations. Bring the harvest to your home with this vibrant wreath. Features a variety of flowers, apples, oranges, and vines. This Garden Twig Wreath features fall flowers combined with mini pumpkins, leaves and berries. This Fall Fields 24" Cotton Wreath is handmade on a sturdy vine base and filled with faux cotton, pale hydrangeas, oak leaves, berries, wild faux grass and a mixture of artificial greens. A stunning autumn decoration hangs up late summer leave up till after Thanksgiving seasonal decorative accessory to be used as a front door wreath or wall decoration to welcome your guests. Add a touch of traditional autumn color to your fall decor with this festive wreath. Features orange, red and gold berries mixed with fall colored leaves. Some leaves are accented with glitter. Natural twig base for hanging. Rated 2 out of 5 stars.2 total votes. This wreath features a swirl of yellow, orange and red maple leaves on a woven branch base. It is trimmed with an assortment of pumpkins and gourds as well as clusters of yellow and red berries. 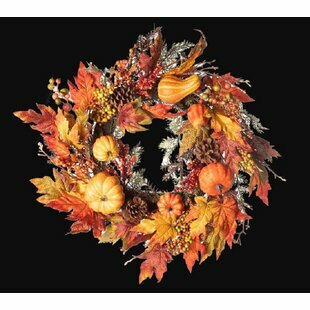 Display this colorful autumn wreath on doors, walls and windows in indoor or covered outdoor locations. This Beautiful Fall 24" Gourd Wreath built on a sturdy grapevine base. It is 24" in diameter and can be used both indoors and outdoors under a covered area. Direct exposure to sunlight or humidity will result in fading and a shorter life. If used properly this wreath will last for many seasons to come. Rated 3 out of 5 stars.26 total votes. This Give Thanks Always Burlap Door Décor is crafted from a medium-weight, poly-burlap material with detailed stitching. The unique blend of fibers makes this flag completely safe for outdoor use in all types of weather. This classic design works year round and hangs from a coordinating grosgrain ribbon. Bright sunflowers and hydrangea mix paired with faux pumpkins to take the lead in this stunning creation. Perfect for your front door or that special place in your home that needs that "wow" factor. Add a touch of traditional autumn color to your fall decor with this wreath. Features orange berries and mini pumpkins. Natural vine twig base for hanging. Rated 3.5 out of 5 stars.7 total votes. Nice, ready for display, perfect for weddings, parties, table pieces and much more. It can be used as home décor, lifestyle décor, and kitchen, porch or bath. Rated 4.5 out of 5 stars.132 total votes. Add a touch of traditional autumn color to your fall decor with this festive wreath. Orange and green leaves accented with orange berries, pine cones, and twigs. Natural twig base for hanging. A symbol of plenty, the cornucopia is often on display during the Thanksgiving season. This wreath is modeled after that abundance with its mixture of fall leaves, berries and gourds. Welcome guests in seasonal style with this Pumpkins and Pine Cones Fall 24" Wreath. Its stunningly warm colors and autumnal detailing will certainly make a statement wherever you showcase it. Perfect for the front door, porch, patio or the wall of any room in your home. The twiggy base is wrapped in faux leaves, pine cones and pumpkins, giving it loads of color and fullness. Use indoors or outside in a covered area. Imported. If you're looking for wreaths for sale online, Wayfair has several options sure to satisfy the pickiest shopper. 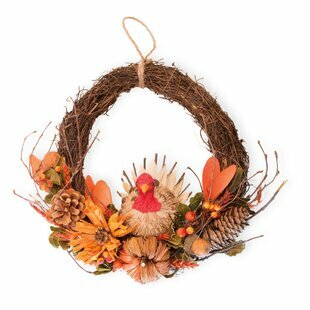 We have a myriad of styles of wreaths, and if you want to narrow your options to something more specific than your current filter of "Holiday / Occasion: Thanksgiving", such as finding wreaths by brands like Flora Decor or Lark Manor just use the filter options. Wayfair is the best place to shop if you're looking for where to buy wreaths online. And remember, we offer free shipping on just about every order over $49.00, so buy wreaths today and have them shipped free.